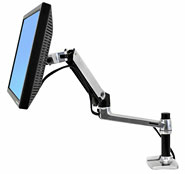 Sleek and streamlined, the Desk Mount LCD Arm frees up space and allows positioning of your display for greater productivity. Reposition your LCD with just a touch. Up. Down. Forward. Back. The LX provides unparalleled range of motion.